Five-star inclusive stays in Mexico - Ole! Mass, mediocre, cheapo all-inclusive resorts in Mexico are being replaced by elegant, gourmet, all you could want and more all-inclusive resorts. And yes, the Riviera Maya is still safe. I was invited by Real Resorts to see for myself last December. 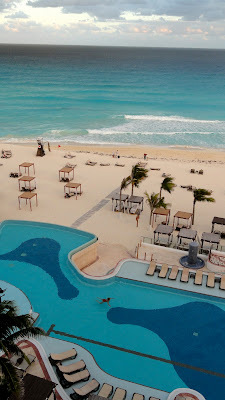 The Royal Playa del Carmen and the Royal Cancun far exceeded my expectations. Granted, those expectations were pretty low given the bad rep earlier inclusive resorts had garnered. The trip was oriented to travel writers who cover wedding and honeymoon destinations and if I were in the market for one, these two resorts would definitely be on my list. My immersion into inclusive world began in Playa del Carmen, about an hour's drive from the Cancun airport. After passing resorts in the middle of nowhere, it was a relief to see the Royal was in the town of Playa del Carmen. Nothing I hate worse than traveling to another country and being isolated from what makes that destination special. The town is new, one created by the resort phenomenon. 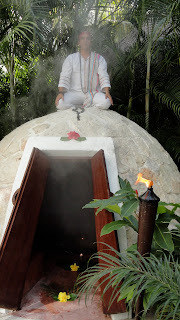 In the Mayan era, it was where one went to get water and coconuts and to take a boat to Cozumel, an island dedicated to the goddess of fertility and one of the most important locales in the Mayan civilization. A dozen years ago there were 30 people living here, now there are 100,000 in the area. 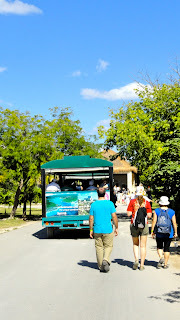 It still is where you catch a ferry to Cozumel to see where the cruise ships stop. 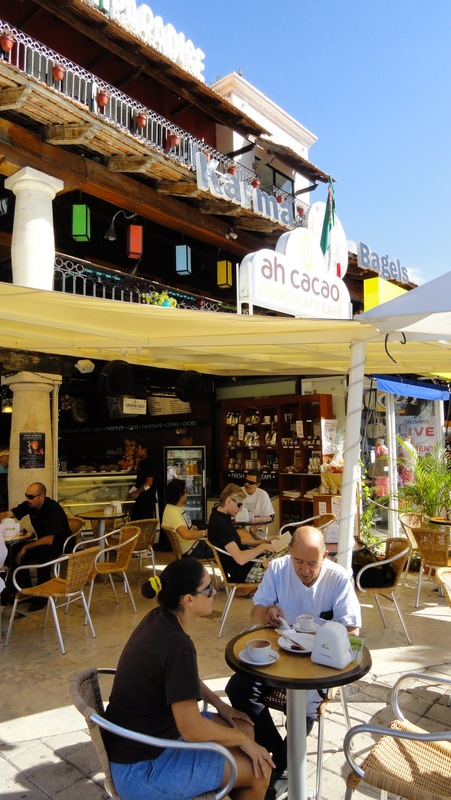 The Royal is smack dab in downtown; across the street and down the block a bit you'll find "ah cacao, chocolate cafe," a fun little spot with great coffee, hot chocolate and all things chocolate from shampoo to body wrap. Tip: The town area is pretty flat but nothing is even; watch where you step and stop to gawk. The Royal is an adults only resort and the age span of guests ran from early 20s to well past social security with most somewhere in between. The rooms are large and well appointed - Jacuzzi tubs for two - with constantly stocked mini frig and balconies that overlook the large central pool and have peekaboo ocean views. Because of its urban locale, few rooms directly face the ocean, but there's a book cart that circulates around the pool to ensure you have something to read between dips and naps. Speaking of weddings, the resort staged a Mayan wedding for our benefit and it was quite interesting, especially the costumed and body-painted dancers who participated along with a shaman. It began with a purification ceremony and ended on the beach, with homage given to mother earth, wind, fire and water throughout. 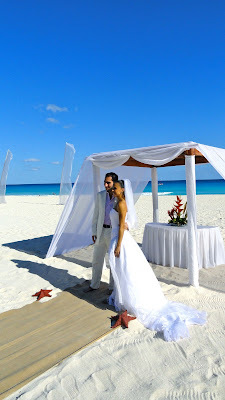 More traditional Western-style weddings usually take place in a gazebo on the beach, but couples can personalize their services with Christian and Mayan elements. For wedding parties with children, there's an adjacent all-inclusive sister resort, Gran Porto Real, for families next door and children can come to the Royal for the ceremonies. Warning: There are elevators that eliminate many of the stairs but unless you ask for a room near the lobby you will do a lot of walking. Nearer the lobby though means farther from the ocean. 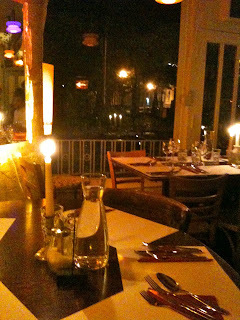 The restaurants guests choose from are varied and the food is excellent. For the cocktail set, you name your brand, top shelfers included. 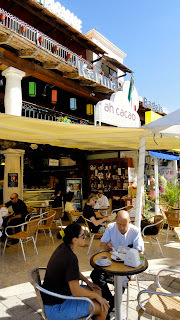 I liked being in the town and the laid back, relaxed atmosphere here. It's also close to the ruins at Tulum. 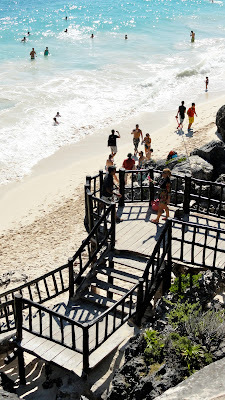 Not nearly as big as the better known ruins at Chichen Itza, Tulum is still well worth a visit if only for the spectacular views from cliffs to sea. Tip: Take the little trolley from parking lot to entrance to the ruins and save the walking for then. 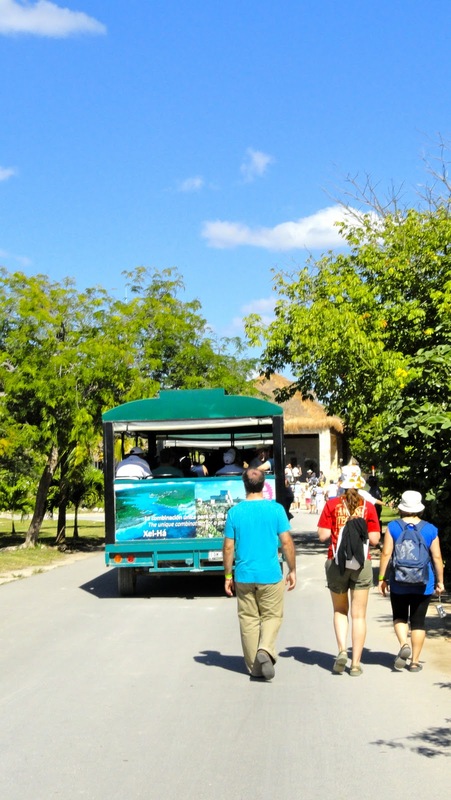 A major port for the Mayans, Tulum - or Zama as it was known then - was a trading center for jade, malachite, lapis, red coral, tiger's eye, bird feathers and honey, according to Carlos, our guide. The Maya were one of the earliest civilizations of sky watchers and plotted the seasons with great accuracy. it dates from 550 BCE and hit its peak 300-900 AD. Like the Egyptians their buildings were brightly painted and deeply etched with bas-relief work. Visitors are no longer allowed to enter the buildings or in many cases get near enough to get the full impact of the artistry that once adorned them. The "Castle" is the most impressive structure towering at cliff's edge and one you don't want to miss. Warning: You will encounter lots of steps to reach it: 18 of varying heights up, 17 down if you take the short cut to the left. It's doable but pay attention and step carefully to avoid a fall. The overlook is spectacular and the breeze on a warm day is most refreshing. Dedicated beach goers can climb down to the water - and return via a switchback of steps. Too many for me so I don't have an accurate count. 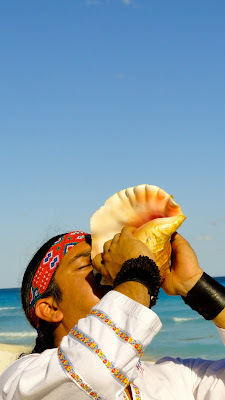 If you want action, Cancun, where the Maya Riviera got its start, is the place to head. Developed in the '60s and '70s, it is a totally planned city. One that was looking a little on the shabby side by 2005. When hurricane Wilma battered the area for 36 hours in October, 2005, it necessitated massive urban renewal, especially for oceanfront properties. Thus began the transition from tacky and cheapo all inclusive to luxury and top shelf all inclusive. The Royal Cancun has a great location on the ocean side of the strip that separates it from the bay. Close enough to the inner city to facilitate hitting a few night spots but far enough away to avoid the noise and busy-ness. I liked the facility, too. More of its rooms, basically the same as those in Playa del Carmen, face the ocean with large balconies that overlook it and the large pool complex. Both hotels' balconies feature hammocks for lazing. Tip: Fewer stairs within the complex, too. Again, the food and variety of a la carte restaurants are first-rate. I particularly liked Asiana with its Teppenyaki table as well as regular dining and the delightful Maria Marie with its Mexican-French fusion fare. Warning: The spa services here are excellent but comes with the inconvenience of stairs which you face in your robe and spa slippers; a definite safety hazard especially after a massage that leaves you limp. In addition to two weddings staged for us by the staff, there was a real wedding party wherever we looked and they added a hearty dose of good spirits to the scene. Like its sister hotel in Playa del Carmen, the Cancun Real has an adjacent family-friendly inclusive resort. It also has a Catholic chapel, unique to inclusive destination wedding world. Nightly entertainment is scheduled in the lobby but a night at Coco Bongo Club downtown will give you a LOT to talk about when you go home. It's pricey, the drinks and beer are watered and lousy but the entertainment and atmosphere is unforgettable. Think disco meets Cirque du Soleil with confetti shooting into the air. In short, the Real Resorts were a revelation to this former all inclusive snob. 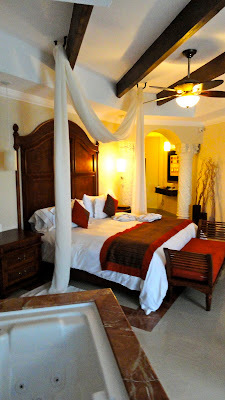 I liked the more Mexican and relaxing vibe in Playa del Carmen, the hotel and its layout in Cancun. I'd go back to either at the drop of a sombrero. Or the toot of a conch shell. The only reason I went to Berlin was to see certain works of art in its museums, but that isn't the only reason I want to go back. The museums - I had six of the city's 180 on my must-see list for the five days I would be there. The three I saw - Neues and Pergamon on Museum Island - and the Mauermuseum at Checkpoint Charlie - were everything I had anticipated and more. 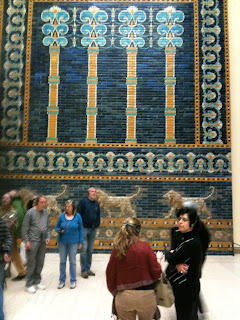 The friezes from the Altar of Zeus taken from Pergamon and the Ishtar Gate were as spectacular as I had imagined. The bust of Nefertiti was every bit as mesmerizing as promised and the stories, documents and artifacts of East Berliners' struggle for freedom had me in tears. 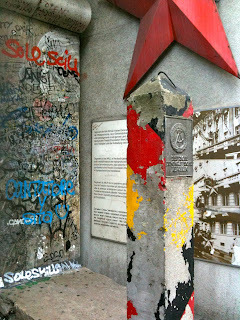 Nothing, however, prepared me for the city's beauty, spirit and the exhilaration of what the world's young people are doing and creating amid the streets and alleys, war-damaged and renovated buildings of East Berlin. Seeing even a small bit of it all made for a memorable whirlwind that began early in the morning and lasted well into the wee smalls of the next. Colleague Carol Timblin and I traveled by train from Leipzig to Berlin and were met at that amazing, seven-level train station by her friend, journalist Stefan Elfenbein. 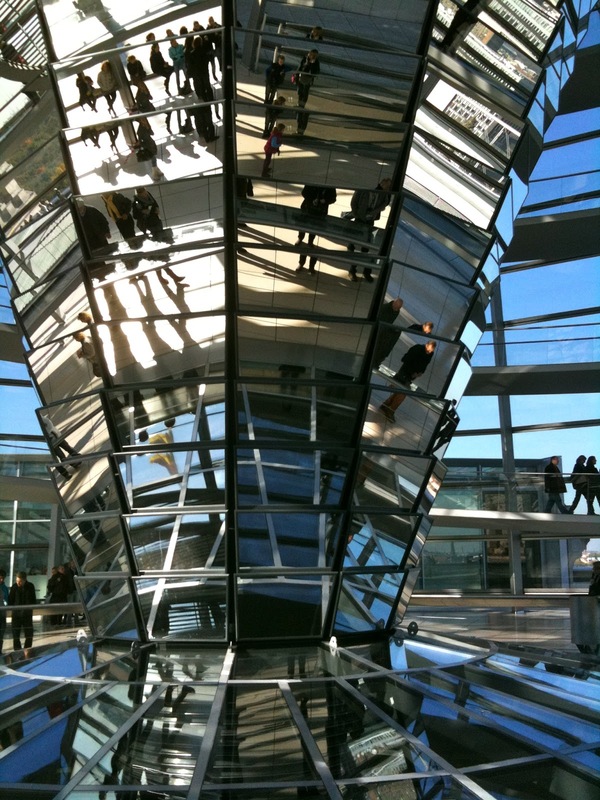 He immediately whisked us off to the Reichstag Building where the Bundestag meets to see the crystal dome, a symbol of the city's reunification. It wasn't on any of my lists but charming Stefan was impossible to defy so I went and was gobsmacked by the line of people waiting to get in. It seemed to stretch for a quarter-mile into the Tiergarten. "We don't do that," said Stefan, "we have reservations at the restaurant." Tip: A reservation at the roof terrace restaurant gets you to the front of the line immediately. After coffee, breakfast, lunch or dinner, you can catch the elevator to the striking dome which is well worth a visit. You can pick up a free "Outlooks" pamphlet that I.D.s significant parts of the panorama you are viewing; a great way to get your bearings. There is a ramp rather than steps up to the top of the cupola and it slopes gently enough for Levelers to make the ascent. That was our introduction to Berlin, from above. Later and below, Stefan showed us the line where the wall had been, pointed us in several appropriate directions and said he would meet us that night at our hotel for another tour. The day was bright and sunny so rather than see anything from the inside, we chose to see more of the city from the outside, by boat. 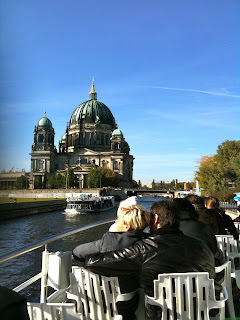 Had no idea Berlin was a city of canals. 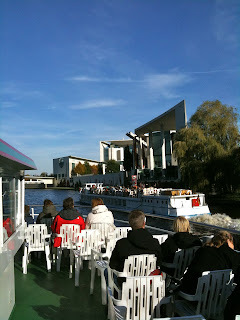 According to the narration during out cruise along the Spee River, with 650 bridges, Berlin has more than Venice, Amsterdam and Stockholm combined. Try that as a bar bet sometimes. Tip: Levelers, there are 19 steps down to the Reederei Winkler boats behind the Friederichstrasse train station and seven steps to the top deck. No big challenge. See, as we did, the artsy Orianienburger, part of the former East Berlin, at night, preferably midnight or later. The area is known for alleyways that open into courtyards often surrounded by interesting galleries and shops. "Always go into the back yard," Stefan advised, "it's where things happen." At Tacheles it surely is. Once one of the largest department stores in Berlin, it was bombed in the middle during then war and scheduled for dynamiting by the Russians afterward. Instead, young artists moved in, set up ateliers and refused to move. Now they have a lease, can live there as long as it is open to the public and have created a popular gathering place with bars, galleries, an open, dirt-floored courtyard where bonfires provide light and warmth and sculptors have cobbled work and living spaces. Didn't see any inspiring work but by living, eating and working together the young artists have achieved more of the socialist ideal than communism could ever impose. Nearby, German cuisine, swing music and dancers filled Clarchens Ballhaus in an irresistible melange of good food, drink and endless energy. Next door and upstairs in the Mirror Salon, ballroom dancers circled a once grand ballroom in more formalized movements. Funky shops and intriguing galleries tempted us to return in daylight if only there had been time. In another yard we went upstairs and listened to electronic music from The Dead Chickens whose version of a Muppet Show song must make Jim Henson most uncomfortable in his grave. Tip: In the Pergamon Museum there is a lift next to the coat racks but you will have to decide for yourself if you are up for climbing up and down the 27 very steep steps (no handrails) to the frieze of Telephos in the recreated temple. There are lifts to all the floors in the Neues. Another element in East Berlin worth exploring - restaurants and cafes where you never know who is in the kitchen and the food comes with no prices, literally. Chefs from all over volunteer their services to be able to cook what they want and customers select from the night's limited menu, help themselves to a plethora of wine and at the end, pay what they think it was worth. Amazingly, many have been around for more than seven years. 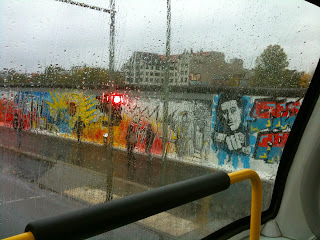 Our last views of Berlin came via the hop on, hop off tour bus on a day when winter and its rain had taken over. At least we rode by what most tourists visit. Next time I'll do it on a clear day or two. Other than the Brandenburg Gate, I missed many of the major tourist attractions Berlin offers but thanks to Stefan, I had a much more interesting insight into the city that is to come. It's one I want to revisit often. Music, art and the peaceful revolution are the points that stick in my mind after a much too short stop in Leipzig, Germany. Unfortunately, I don't have the photos to match - camera problems plagued all attempts to record this stop. 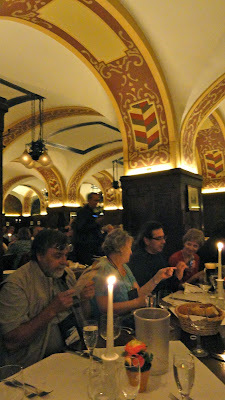 We arrived early evening and made a beeline to Auerbachs Keller where our group of way too many travel writers and associates had dinner. I say way too many because we literally took over the place - not a good way to judge a restaurant or to have an authentic experience. It was an important part of the first trade court in Leipzig, built 1530 to 1538, and has been dispensing huge steins of beer and bounteous plates of food ever since. I'm sure every tourist tour goes there but it's fun anyway and the dark beer, Ur-kroftitzer (if I decipher my notes correctly), is excellent. Goethe was a student here, used the Keller for a scene in Faust, and I bet he drank some too. Tip: There are 27 steps down from street level to the restaurant. As we left the Keller we passed by the 800-year-old St. Nicholas' Church where in 1989 the Peaceful Revolution began and Leipzig became known as the "City of Heroes." For a decade, East Germans had been meeting at the church on Mondays for Prayers for Peace sessions to pray and talk politics. What began with a dozen dissidents became a movement and on Oct. 9, 8,000 packed the church. Afterward, 70,000-100,000 people gathered and marched around the city center. 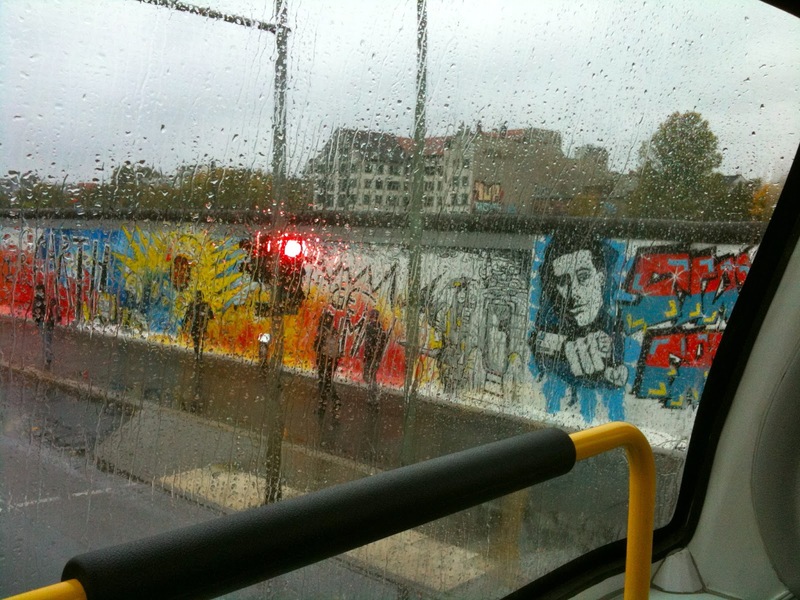 Under banners of "We are the people" and "No violence," they went past headquarters of the feared Stasi, secret police, and ended at the train station. As the East German regime said, according to our guide, "We were prepared for everything but not for people with candles in their hands walking around Leipzig." More peaceful demonstrations followed and on Oct. 23, 300,000 people returned to city center with their banners and candles. 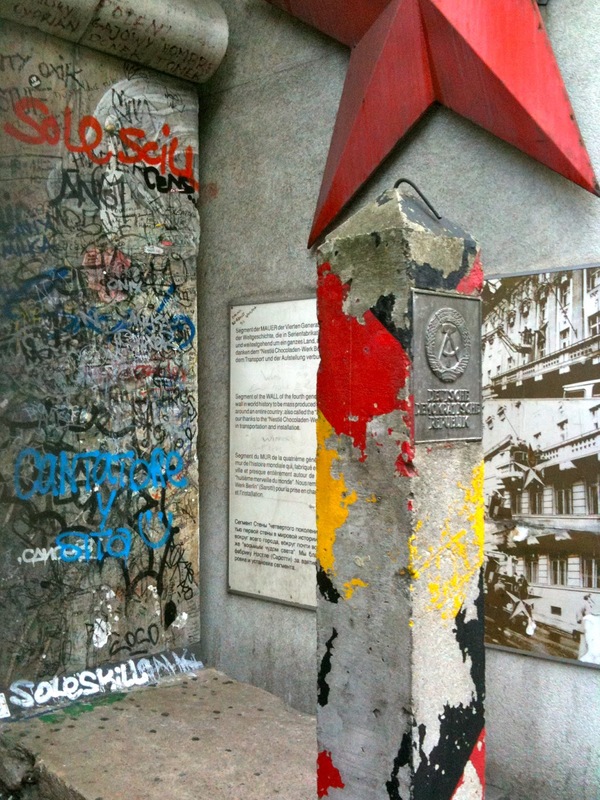 Two weeks later, the Berlin Wall came down, the Russians left and Germany was on its way to reunification. Music has always put a lilt in the air for Leipzigers. Many are the musicians and composers connected to the city. J.S. 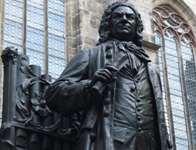 Bach, former choirmaster of St. Thomas' Church, lived here for 27 years and is buried at in the choir hall. Felix Mendelssohn directed the Gewandhaus Orchestra and his home, now a museum to him, was a magnet for other musicians. Clara and Robert Schumann were perhaps the city's most famous lovers and their former home is both exhibit space and concert hall. Richard Wagner was born and educated here. Edvard Grieg studied and wrote his first compositions here. Gustav Mahler became assistant conductor of the Leipzig Opera at age 26 and completed his First Symphony here. Each has his own festival, too. The Museum of Musical Instruments has one of the world's largest collections of its kind. Alas, the only world I had time to dip into was the art world and only a day's sampling of that. Still, it was enough to consider the city a major stop for art lovers. Spinnerei, once the biggest cotton spinning mill in Europe, complete with workers' homes, gardens and kindergarten, has become the center of contemporary artistic activity. Galleries, artists' ateliers and one of the best art supply stores I've encountered haven't begun to fill the available space, but give it time. Once Neo Rauch, probably the Leipzig's artist most familiar to Westerners, moved his studio here other artists, craftsmen and galleries followed. It's definitely a place to visit in warmer weather. As you can imagine it's a bear to heat and once winter hits - it had by mid October last year - the artists move to warmer digs. Warning. Levelers, there are a lot of steps: some buildings rise five-stories with no elevators. However, many of the galleries and the art store are on street level. 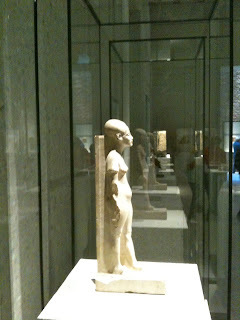 It would be a good idea to visit the exceptional Museum of Fine Arts first. Its eye opening collection contains many familiar names but more important are the ones which will be new to you. The German artists in general and the Leipzig School in particular are relatively unknown to most of us, a shame for we've been missing some wonderful work. In addition to Rauch, I was intrigued with works by Gustav Adolph Hennig, of course the Maxes - Klinger, Liebermon and Beckman, Otto Mueller, Raul Kleinschmidt (his dancer is not a Degas sprite), Arno Rink (a teacher in the New Leipzig School), Matthias Weischner, Julia Schmidt and the wonderfully painterly Max Slevogt. Tip: Forget the stairs, take the elevator. It's huge and there's a delightful art film, the result of putting a camera on a dog's back and letting the canine explore his way around the building. Also, as you exit the elevator at each floor, look for the folding chairs you can take around with you. Shoppers, browsers and architecture fans will love wandering the inner city's shopping arcades, courtyards and old trade fair centers. They made Leipzig famous for more than 500 years, but that's something I'll have to explore on another trip.